No-Frills! 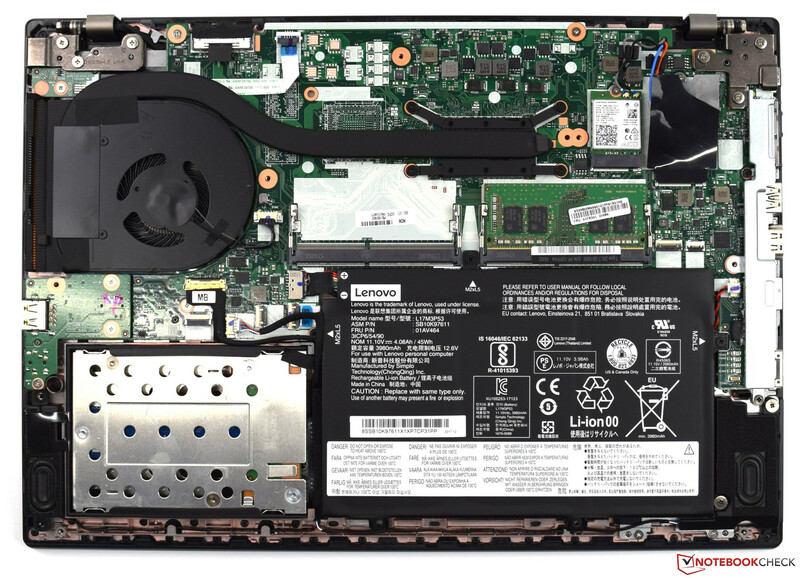 In the convoluted world of office devices, the Lenovo ThinkPad L480 positions itself below the T-Series, but above the more affordable E-Series, all by the same manufacturer. 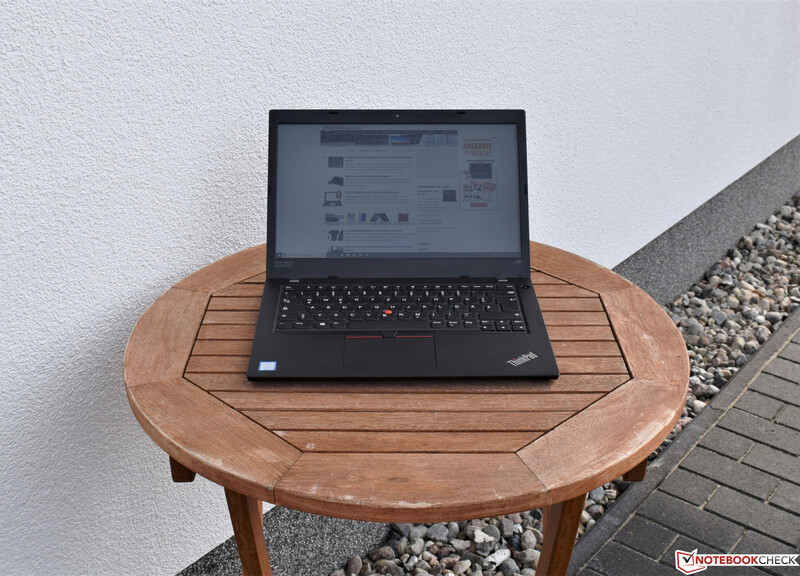 In this review, we shall dive into what sets the L-Series apart and whether this ThinkPad is worth a consideration. 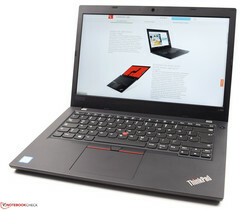 Currently, Lenovo offers very affordable office notebooks with their E-Series of ThinkPads, as well as more premium devices with their T-Series. 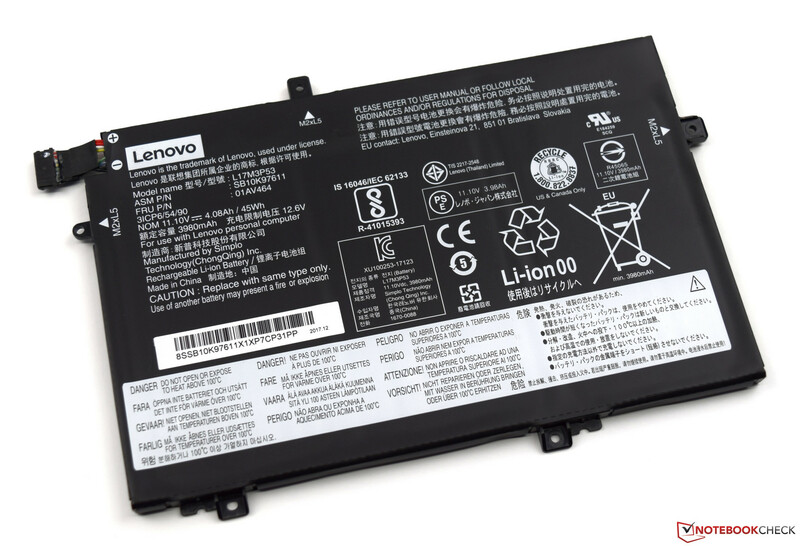 The Lenovo ThinkPad L480 is supposed to slot right in between these two, focusing on both educational facilities and public administration, two areas were good pricing is key. With a base price of 559 Euros (~$685) in its base configuration, the ThinkPad L480 is well priced for the fields it is aimed at. 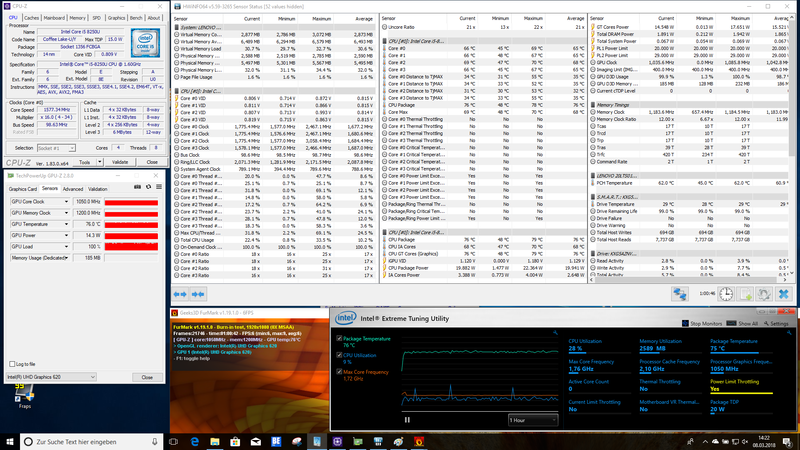 It should be noted that said configuration only offers an Intel Celeron 3965U with 4 GB of memory and a 500 GB HDD. Equally, you will have to settle for a TN-Panel at that price point. More reasonable in our opinion is our test device configuration offering an Intel Core i5-8250U, 8 GB of DDR4 memory and a 256 GB SSD. At this configuration, the price increases to 959 Euros (~$1180). The top of the line configuration contains the Intel Core i7-8550U, a CPU that on paper should be slightly faster than the one found in our configuration. 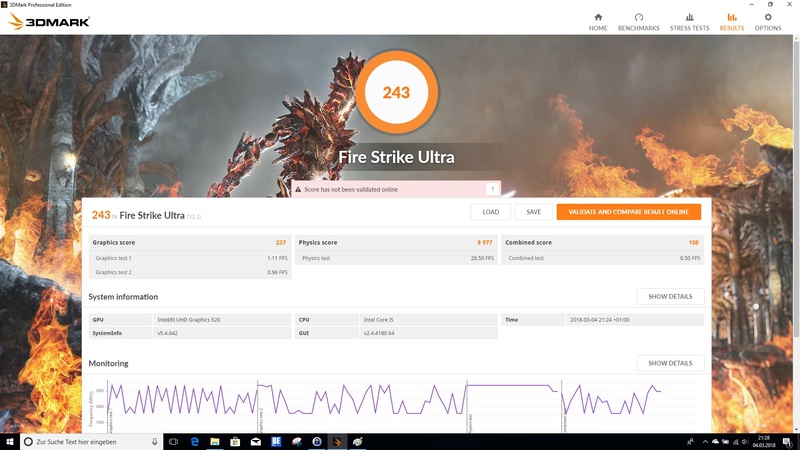 It should be noted though that, under certain conditions, an Intel Core i5-8250U can actually beat an Intel Core i7-8550U, so careful comparison of test results is a must. 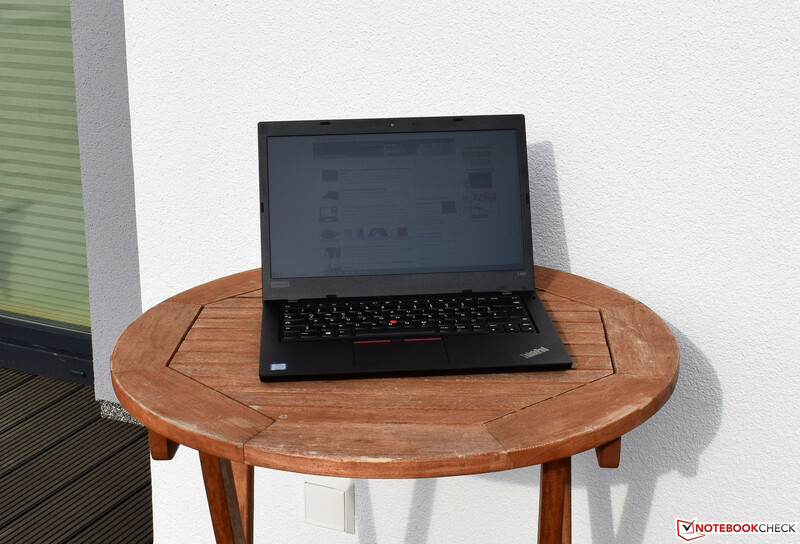 The Lenovo ThinkPad L480 will find itself battling predominantly against its own bredren in our comparison testing. 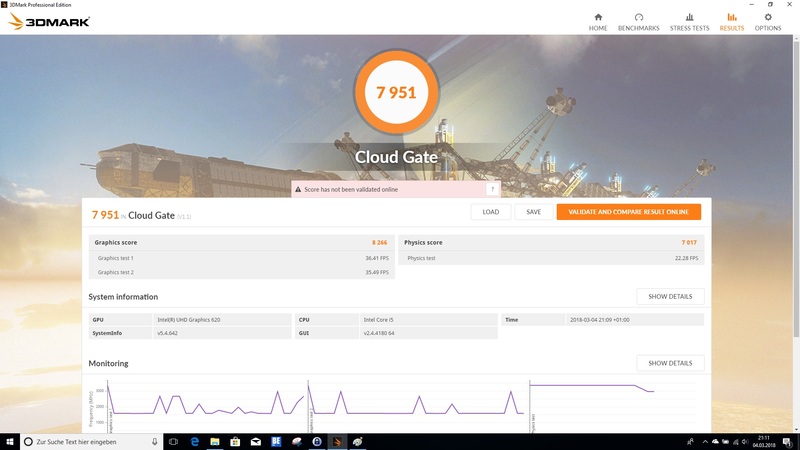 All laptops in our comparison are based on the newest Intel architecture Kaby-Lake, leading to great comparability of performance. 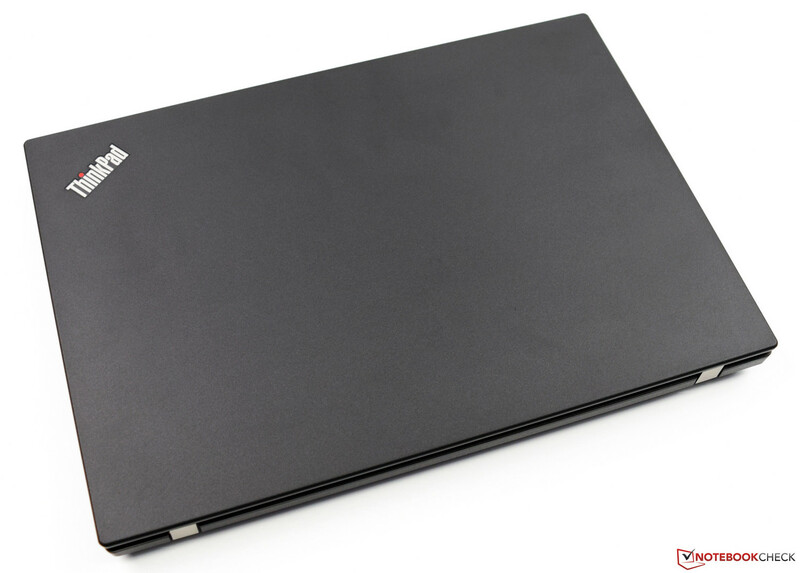 The oldest model in our line up is the Lenovo ThinkPad L470 which should predominantly serve to illustrate the performance improvement between generations. 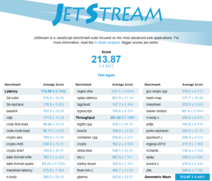 Following are the specific technical details of every device mentioned during this review. , DDR4-2400, 1 slot filled, 1 slot empty, 32 GB max. 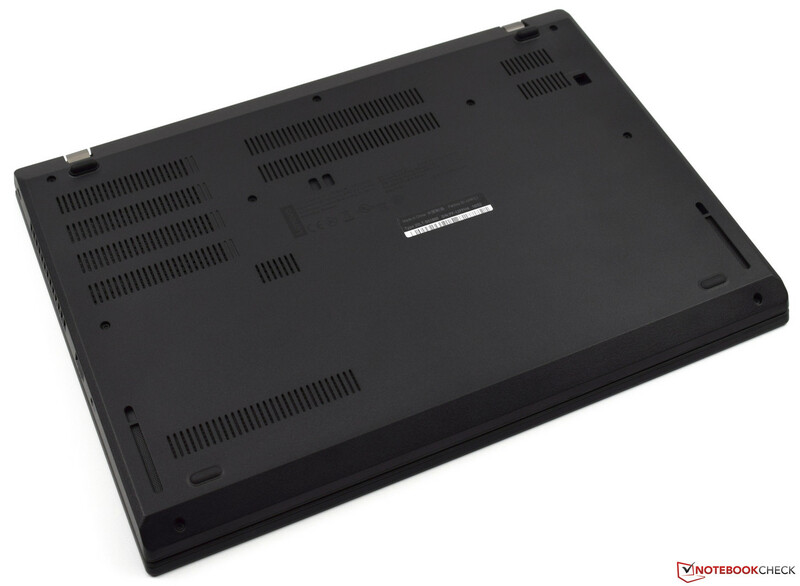 The chassis of the Lenovo ThinkPad L480 has undergone significant changes compared to its predecessor. 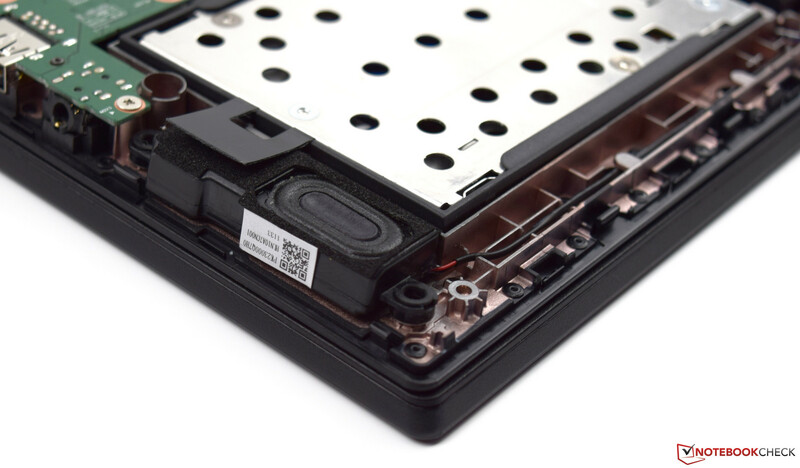 The now non-removable battery leads to an overall thinner chassis compared to the ThinkPad L470. Equally, the base is rather stable, significant force is required to distort it. Applying pressure on the center of the base leads to slight flexing, though this is not outside the norm. Local pressure put on the display's lid does not show on the panel. 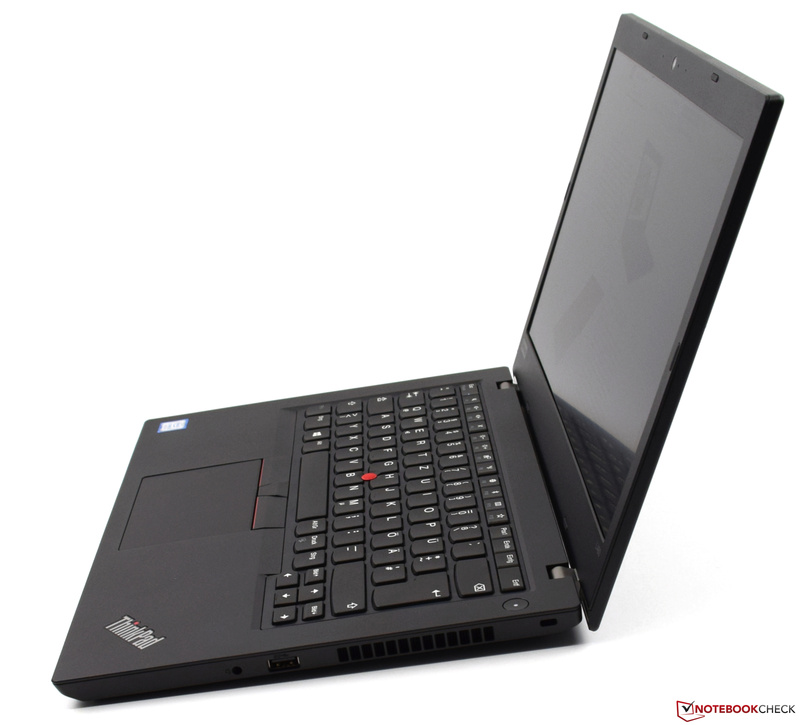 Esthetically, the Lenovo ThinkPad L480 is very basic, staying true to its ThinkPad lineage. Only a silver logo with a red, lid-up “i point” graces the display lid. Build quality is good, so are the hinges which minimize movement of the display during use. One handed opening is sadly only partially possible, the last third of the opening process requires considerable force, leading to one being required to hold the base by hand. All laptops in our comparison are similar in footprint. Only a few millimeters differentiate all of them in width, height, and length. 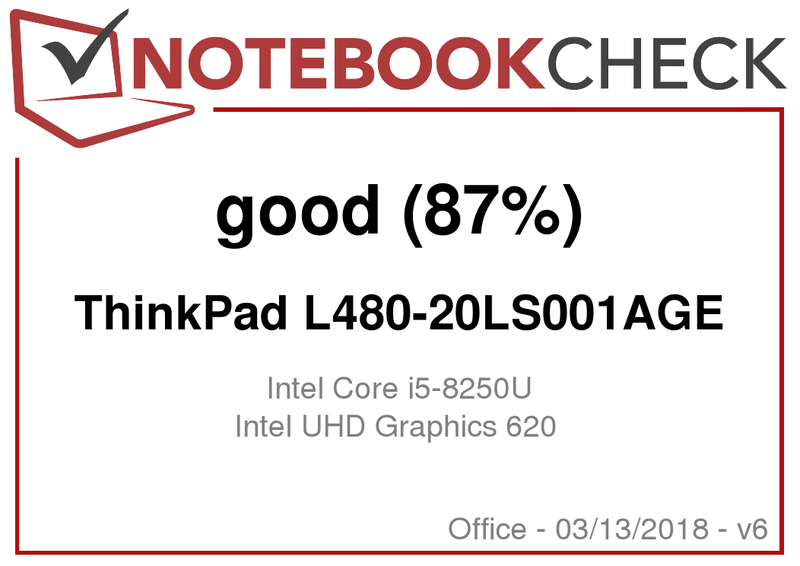 With a weight of 1.7 kg (~3.75 lb), the Lenovo ThinkPad L480 is on the light side though. Only the HP ProBook 440 with its 1.6 kg (~3.53 lb) is minimally lighter. 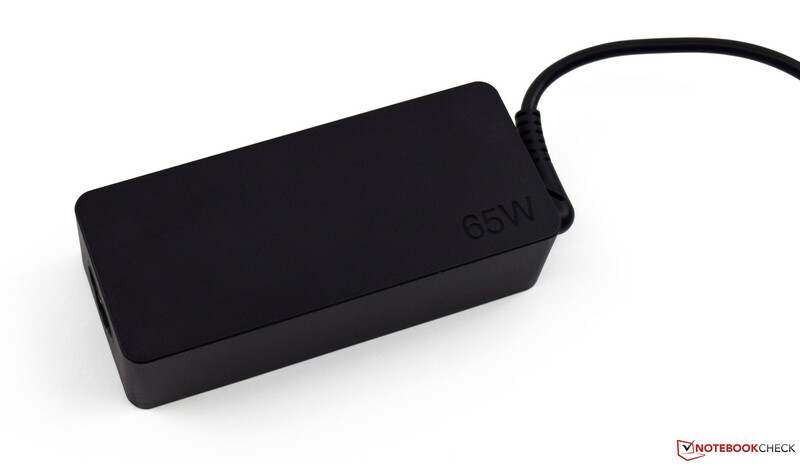 The included 65 W power supply comes in at around 357 grams (~0.8 lb). 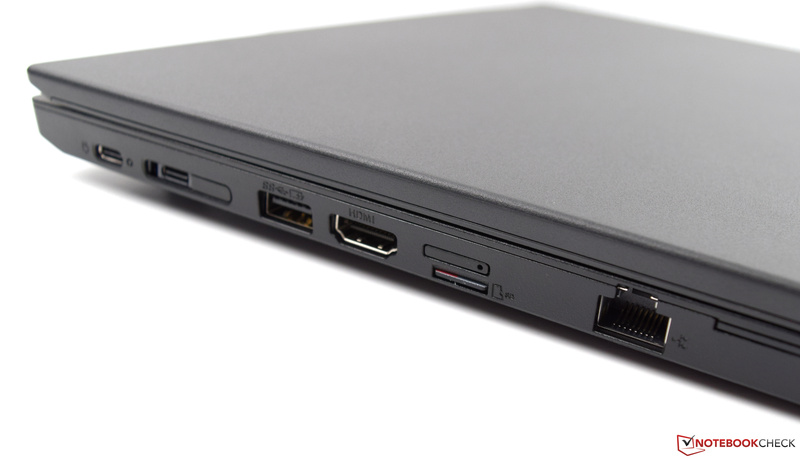 The Lenovo ThinkPad L480 offers a decent selection of ports. The four USB ports, two of which are of the Type-C variety, offer great expandability. Adding to that, one of the USB Type-C ports can serve as a charging port if desired. 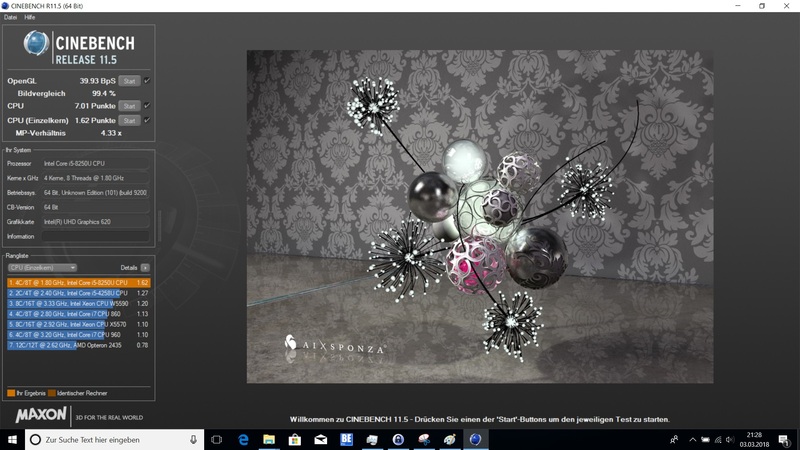 External displays can be connected directly via HDMI or using an optional docking station that utilizes both of the USB Type-C ports or a proprietary port. Also on the left are a microSD card reader and an ethernet jack. A nano-SIM card slot is built in though unusable due to the lack of a WWAN module in our configuration. The placement of ports is acceptable, though the ethernet jack at the front of the device can be rather cumbersome. Lenovo moved, just like we have seen on the E-series (Lenovo ThinkPad E480/E680) from an SD card to a microSD card reader. We doubt that this is advantageous for users, whom now will have to rely on adapters to transfer images from their camera to their laptop. Transfer speeds are decent and above average, though lag behind the competition when it comes to transferring images, leading to the last place with only 71 MB/s for the L480. The microSD card reader operates at least at USB 3 speeds. 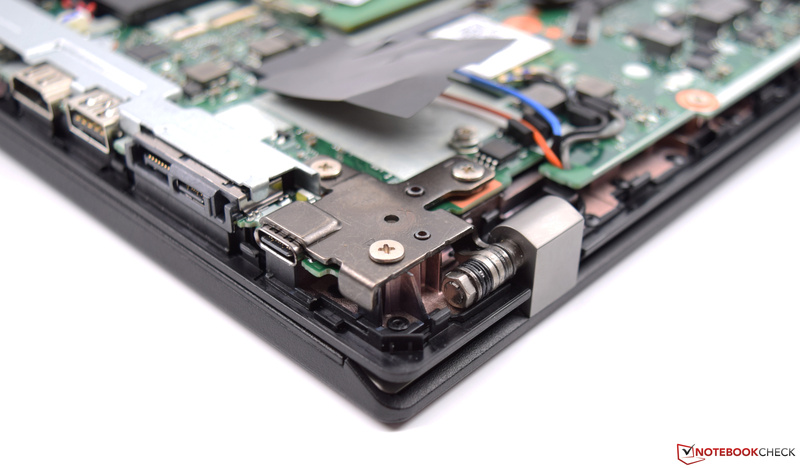 The UHS-II based reader found in the Dell Latitude 5490 is far more impressive in that regard. For wireless communication, the Lenovo ThinkPad L480 relies upon an Intel Dual Band Wireless-AC 8265 with added Bluetooth 4.2 support. 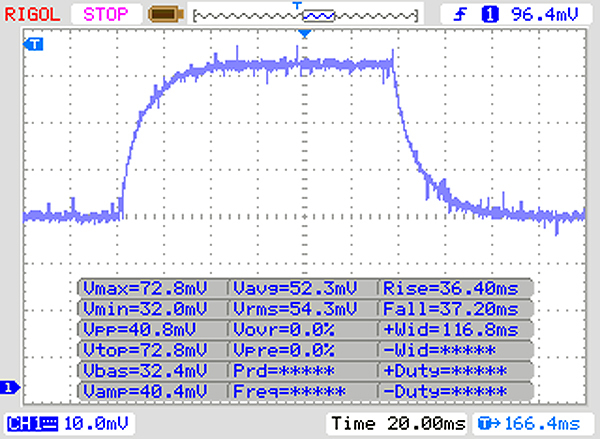 Transfer rates during testing were good, reaching about 667 MBit/s during sending and 529 MBit/s when receiving data. This is an above average result for office devices. 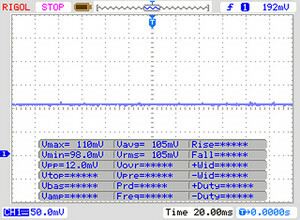 Those preferring a wired connection can fall back on the GBit ethernet port found on the left side. Those wanting to browse on the go may have to splash out an additional 62 Euros (~$76) for the optional WWAN module. Our configuration includes a dTPM 2.0 (Discrete Trusted Platform Module). Kensington lock support is also present on our device. Optionally, there is a fingerprint scanner, as well as a smart card reader. Equally, an infrared base camera for facial authentification is on offer. 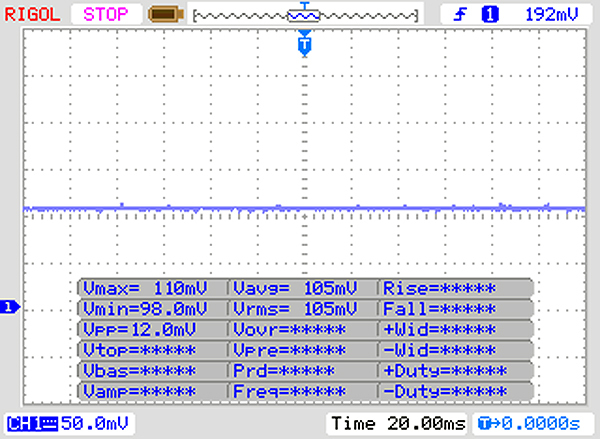 Our device was delivered together with a 65 W power supply and the ever-present safety- and warranty paperwork. 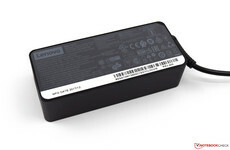 We assume that most Lenovo ThinkPad L480 customers are likely interested in one of the optional docking stations. Aside from USB Type-C based docks, there are also ones using a proprietary port on the back. 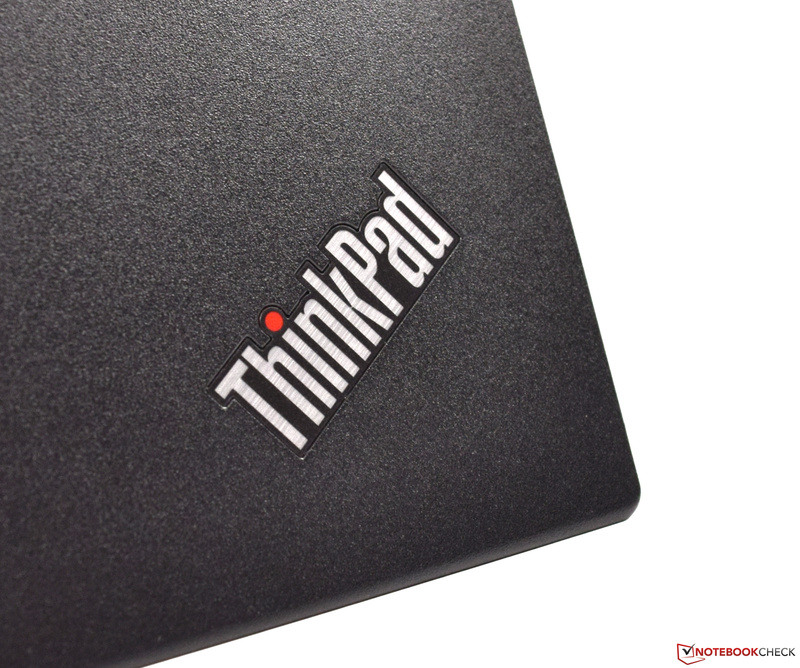 Prices start at 199 Euros (~$249) for the ThinkPad Basic Dock. Maintenance can be tricky due to lack of a maintenance hatch on the back. The bottom plate is removable though with the right set of tools. After one opens the device, all components are easily accessible to replace or upgrade them. 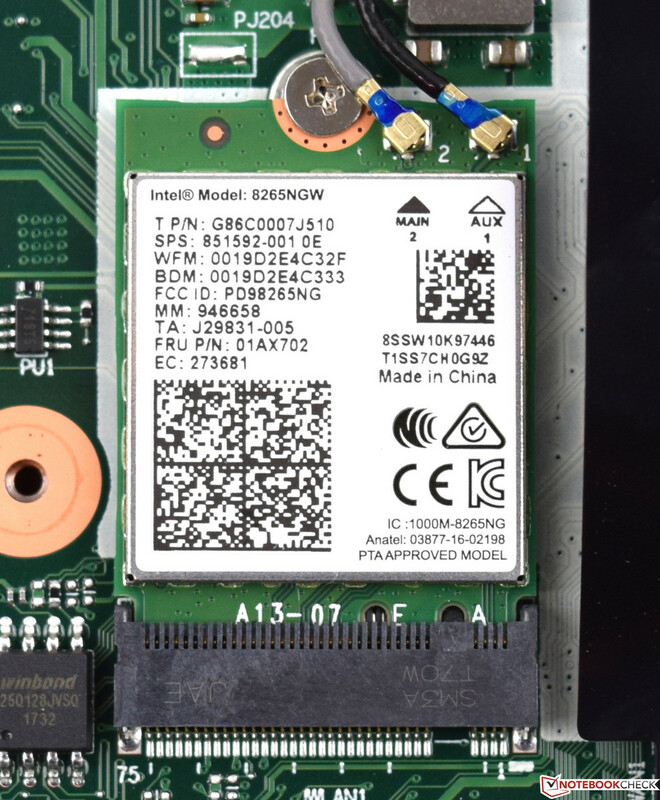 Our configuration offers both an empty memory slot and place for a WWAN module. The basic warranty period is 12 months long. One can prolong it up to five years if desired. The premium “on-site warranty” sets you back 365 Euros (~450$) across five years in Lenovo's online shop. Additional protection covering defects not regularly covered under manufacturer warranty can be obtained for 50 Euros (~$62) during the initial 12 month warranty period. Please see our Guarantees, Return Policies and Warranties FAQ for country-specific information. 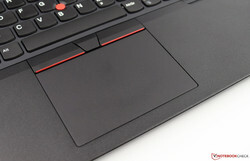 The Lenovo ThinkPad L480 is equipped with a six-row chiclet keyboard. The keys are level with the hand rest. The keys are 16 x 16 millimeter in size and offer decent grip thanks to their roughened surface. Typing feel is great and there is great feedback, thanks to the clearly defined travel and pressure points. Unfortunately, our configuration is not equipped with backlighting, though this is not much of a problem due to the great legend on the keys. 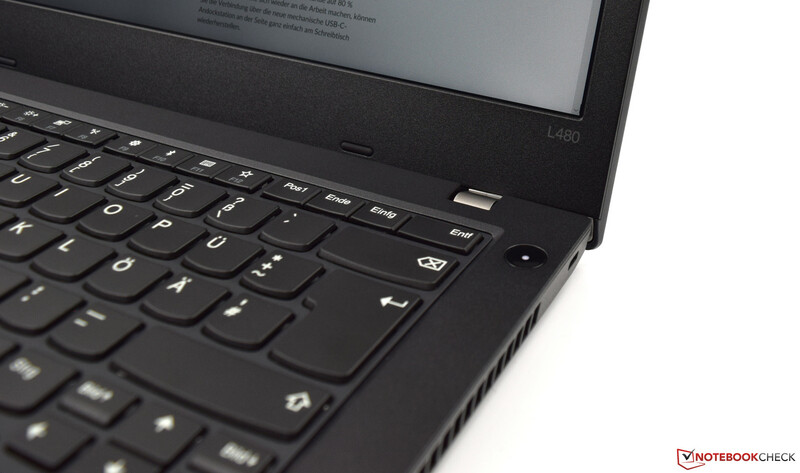 For those who need it, there is the option to equip the ThinkPad L480 with a back lid keyboard, Lenovo demands 22 Euros (~$27) for this addition. 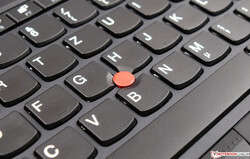 Due to efficient use of space, the ThinkPad is equipped with a large 10 x 6.9 centimeter (~4 in x 2.4 in) touchpad. The surface is smooth and without any tactile structure to it, allowing for effortless use. The device was precise during all of our testing. The physical buttons at the bottom give haptic feedback, yet are quite. The touchpad feels high quality and using it is fun. Adding to that, the ThinkPad L480 includes a trackpoint. This mouse replacement takes some getting used to, but once you learned its operation, you would not want to miss it. 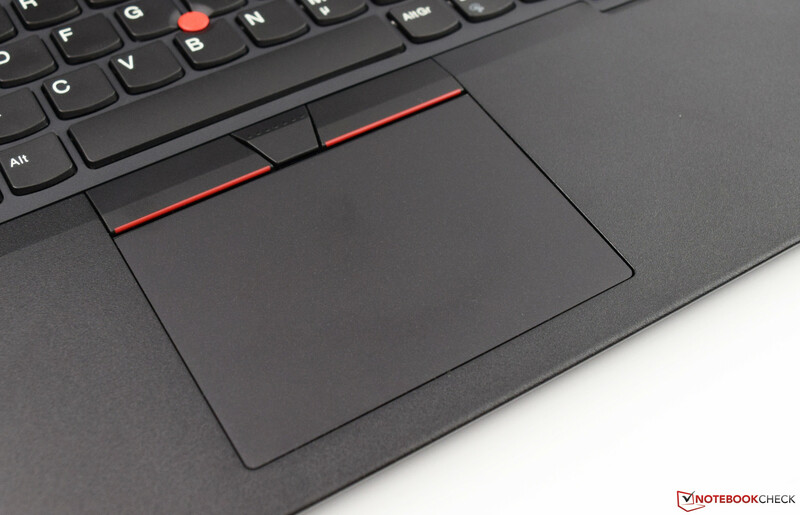 The physical buttons above the touchpad are predominantly for this trackpoint and are of equal quality to those found on the clickpad. Only the center button is slightly louder. 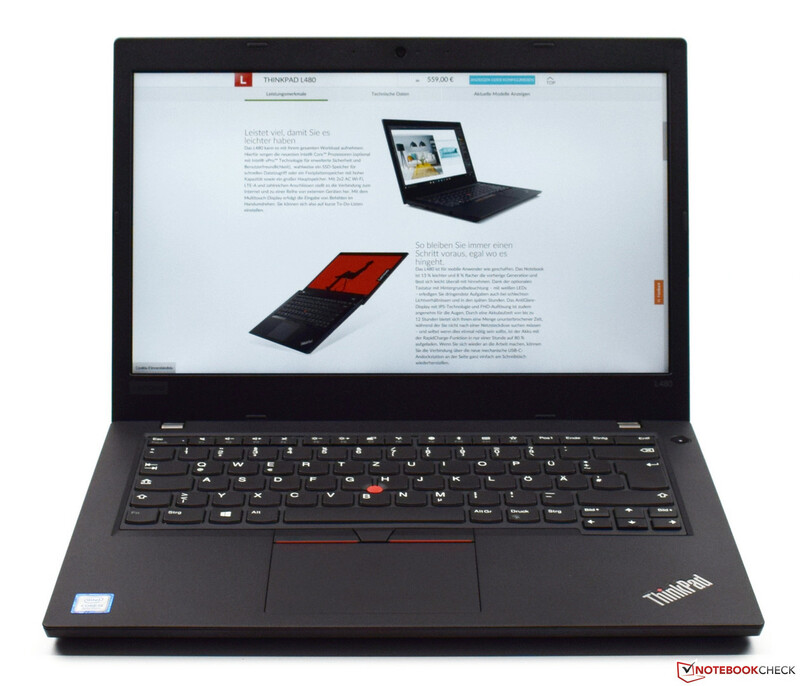 Our Lenovo ThinkPad L480 is equipped with a matte IPS display at 1920x1080. 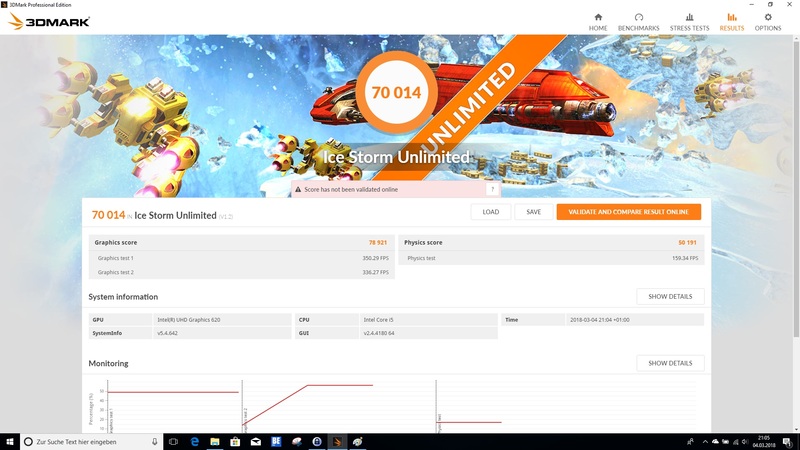 Other configurations of the L480 contain a more affordable TN panel (1366x768), as well as an IPS based touchscreen, which like our test device, runs at 1920x1080 (Surcharge: 67 Euros (~$82)). The average brightness of our configuration is rather low at 222 cd/m². Most competitors offer a much brighter panel. 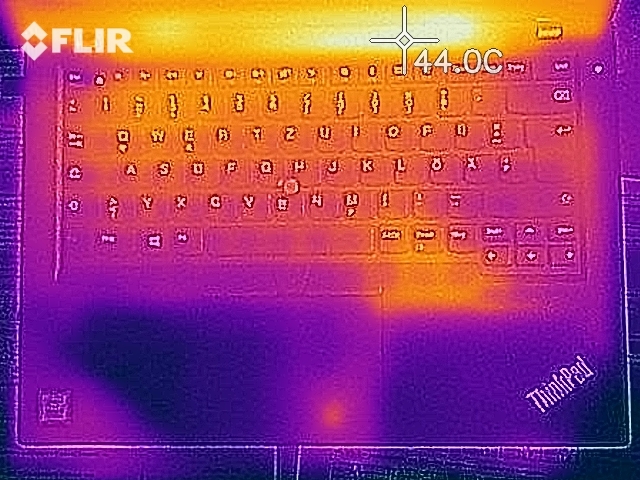 The Lenovo ThinkPad L480 offers excellent contrast (1,306:1) due to its low black levels (0.17). The distribution of brightness at 73% is unfortunately below average. Results of around 90% should be expected in this area. 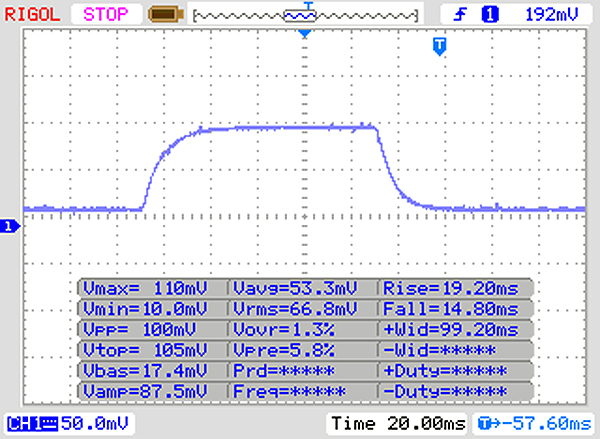 Clouding is minimal, we did not notice any PWM during our testing. The panels reaction time is higher than on competitors. Thanks to the low black levels, the image representation is good despite the underwhelming illumination. 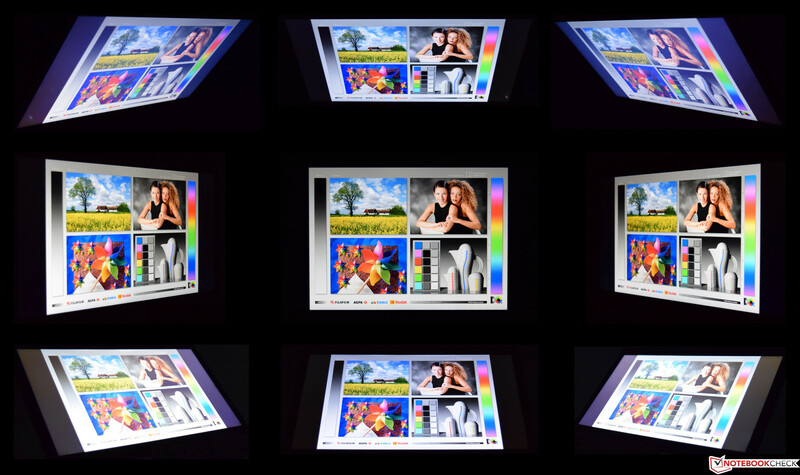 Colors are not matte or washed out despite the matte surface of the display. The delta E-2000 deviation of the greyscales and colors is pre-configured slightly too high, though the L480 still offers the best in our comparison. Color representation is problematic (sRGB 55%; AdobeRGB 35%) making it unsuited for professional image editing. Light office tasks should not be an issue though. Thanks to the matte panel, using the device outside would seem trouble free. 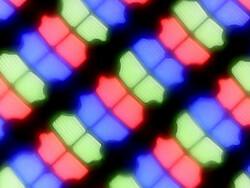 The very low brightness, however, creates problems in this regard. One should consider a spot in the shadow when using the L480 outside. Viewing angles are, thanks to the IPS panel, very good. Only images in the corners get discolored when looking at them from the side. During day to day use, this should not be a problem. 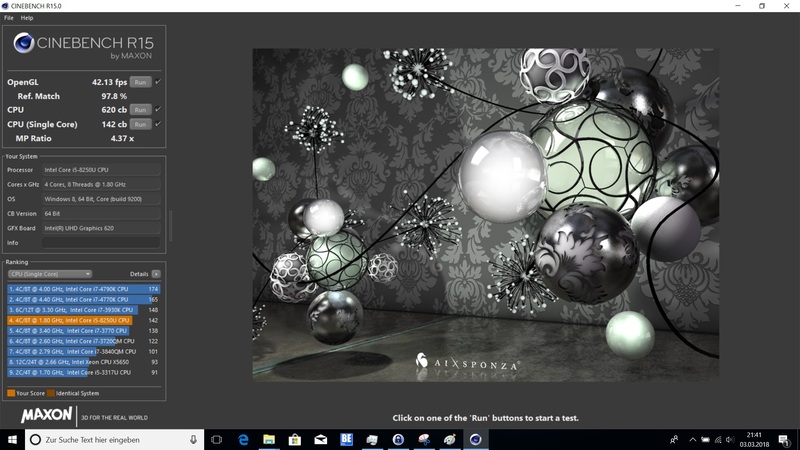 Our configuration, equipped with an Intel Core i5-8250U, offers enough performance for most tasks, though it should be noted that the base configuration comes with an Intel Celeron 3965U, a chip we would not recommend. 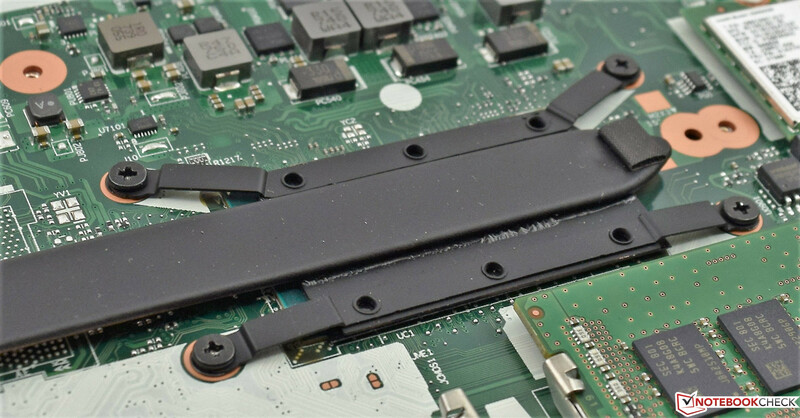 8 GB of memory is enough for most office tasks and the 256 GB SSD equally handles its task well. DPC latencies uncover slight issues, something that could be fixed with a driver or BIOS update though. The Intel Core i5-8250U is an efficient four core CPU based on the Kaby-Lake architecture. With a TDP of 15 W, the small SoC can handle eight threads simultaneously and clocks in at a base frequency of 1.6 GHz, which can briefly boost up to 3.4 GHz during demanding tasks. 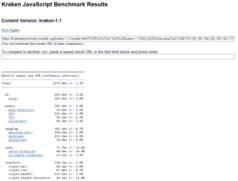 Lookin at our comparison, all test devices appear very close in single threaded performance. 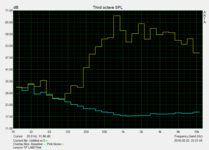 The multi-thread performance is comparable to that of the HP ProBook 440. Our test configuration thus is above average. 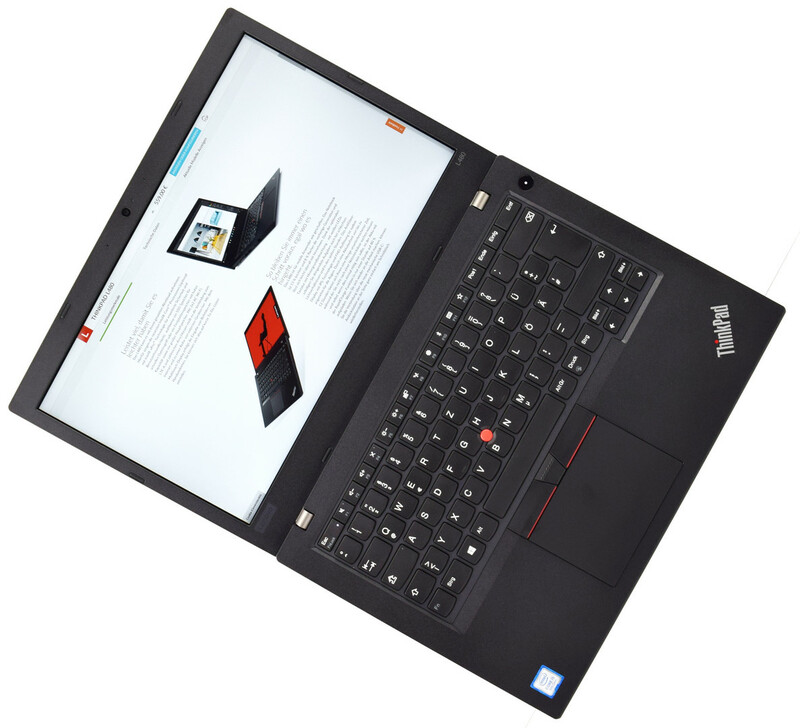 Compared to its predecessor, the Lenovo ThinkPad L470, performance has been improved significantly. 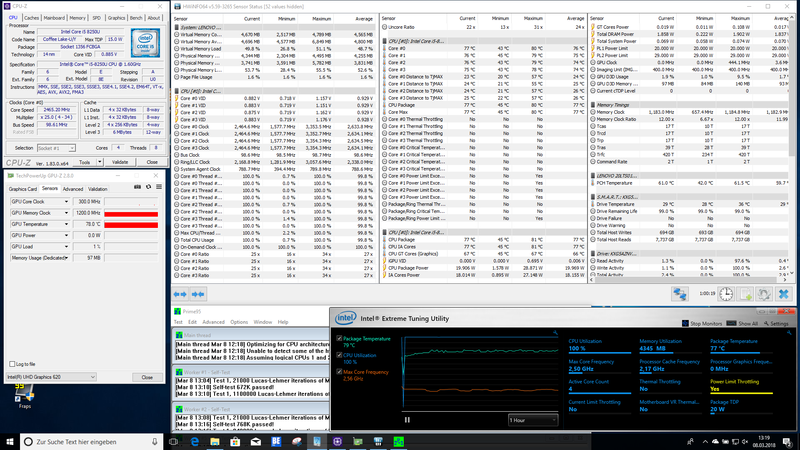 The Intel Core i5-7200U falls behind the Intel Core i5-8250U, especially in multi-threaded workloads. The two additional cores really pay dividends in this area. 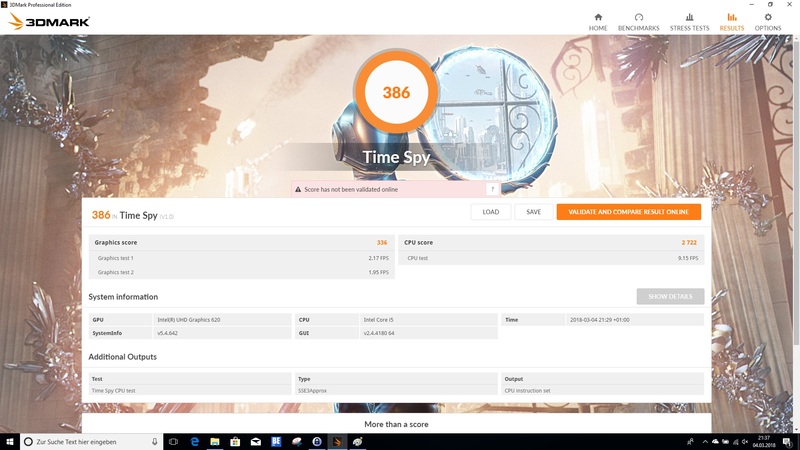 Additional benchmarks and information on the Intel Core i5-8250U can be found here. 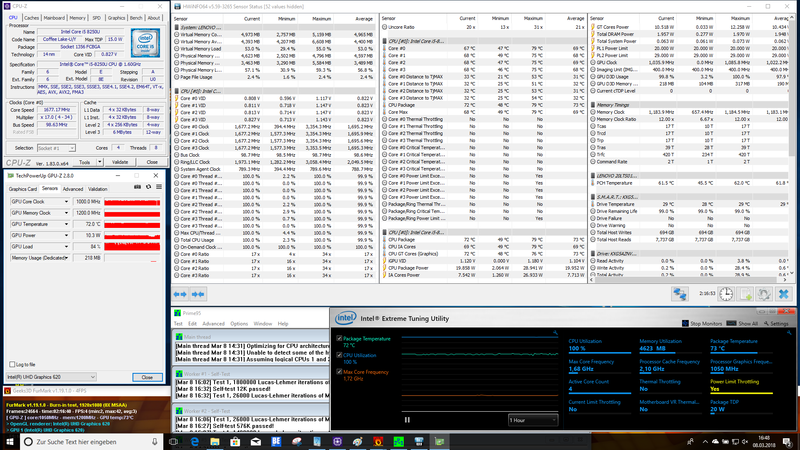 To see, whether the Intel Core i5-8250U throttles, we put it through our Cinebench R15 multi-threaded testing loop. During the second run, the result lowers to 580 points. During the rest of our loop, there are no major deviations, meaning performance remains constant. It can be concluded that the cooling system works as intended and is not overloaded. 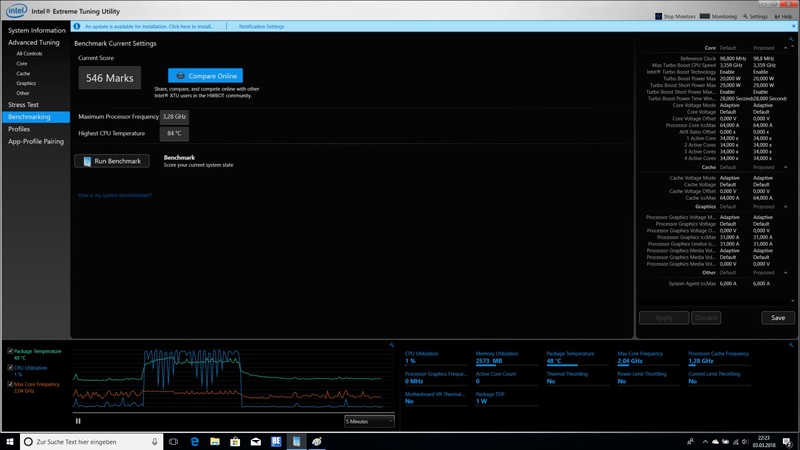 System performance increased dramatically compared to the Lenovo ThinkPad L470. 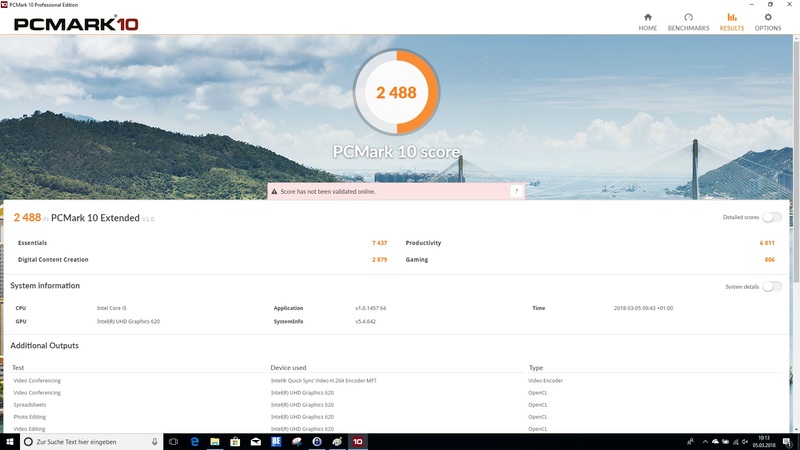 Our test configuration is placed third in overall system performance after the ThinkPad E480 with its dedicated RX 550 and the HP ProBook 440. It should be noted that the L480 is usually only a few points behind these two. 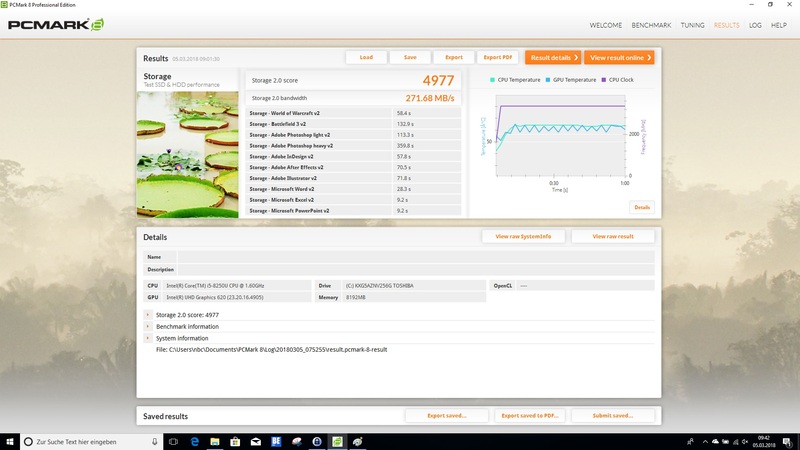 The quick SSD and fast Intel Core i5-8250U ensure fluid operation. 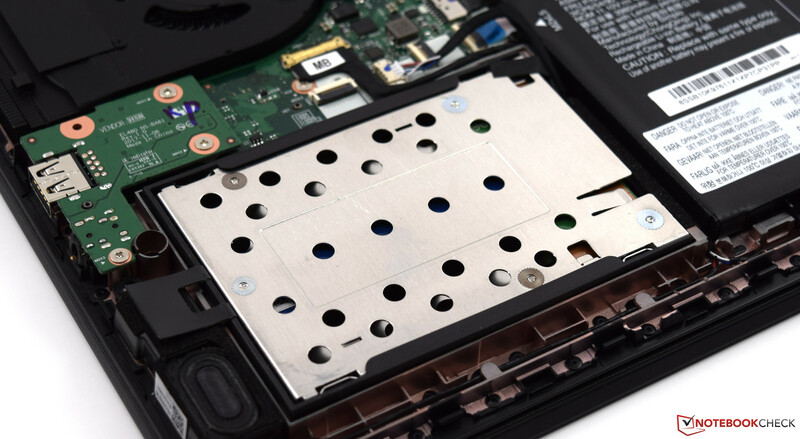 The L480 is equipped with an M.2-2280 256 GB SSD by Toshiba connected via an adapter in the 2.5-inch bay. There is, unfortunately, no separate M.2 slot. Transfer speeds are good, though sequential writes (556 MB/s) could be improved upon. The 4K-Read rate at 30 MB/s is quick which is advantageous when reading small files. 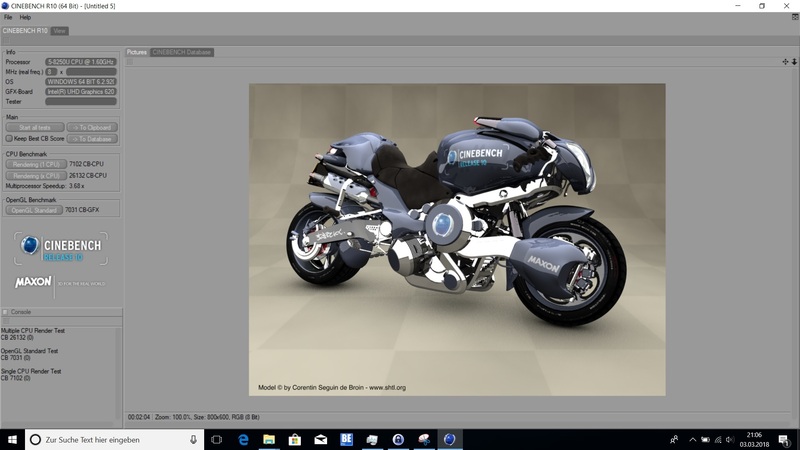 The Intel UHD Graphics 620 handles graphical loads and, thanks to the support of modern codecs, offers good performance when viewing high-resolution videos. 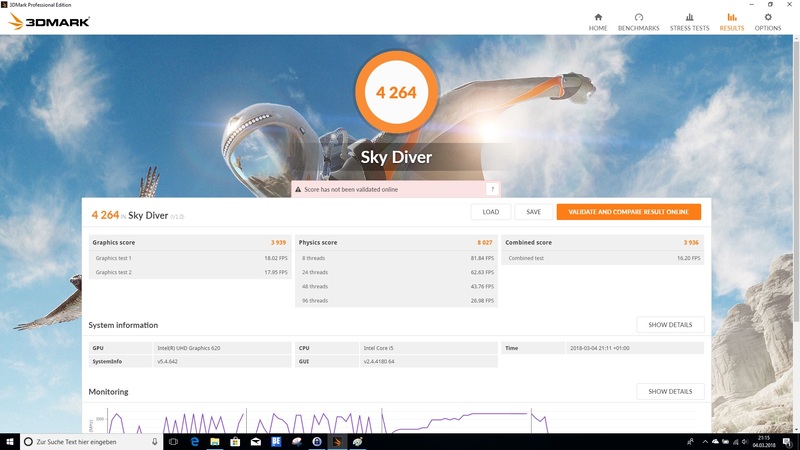 The ThinkPad E480 though, thanks to its dedicated RX 550, offers more graphical performance than any other device in this comparison. 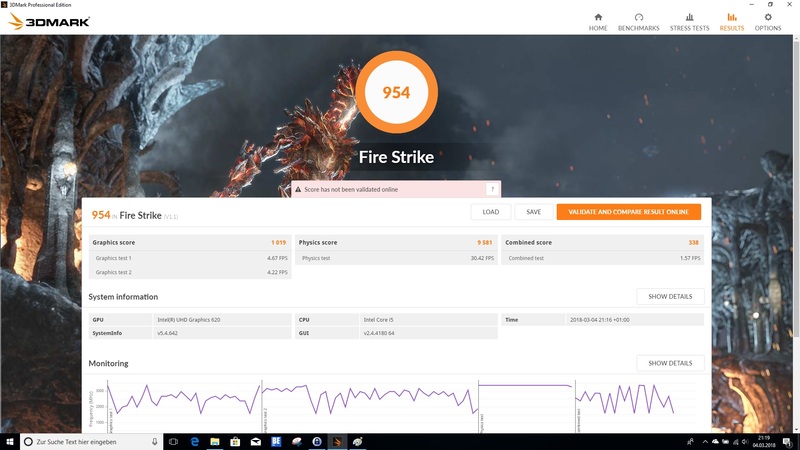 Compared to its predecessor, the L480 has again increased performance significantly. 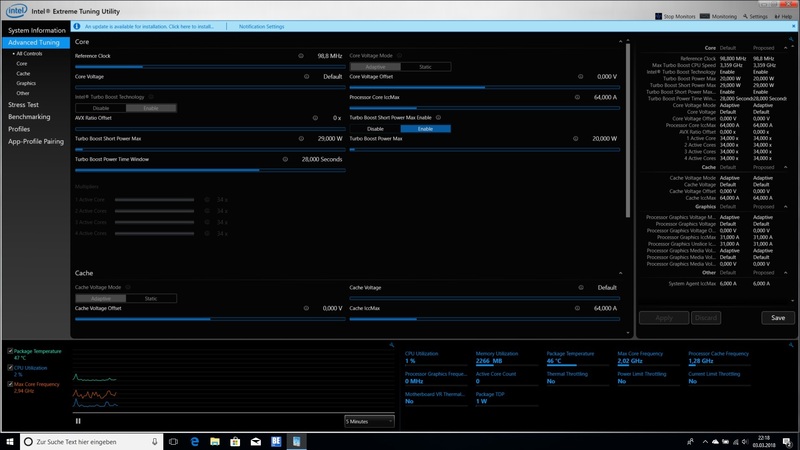 Additional benchmarks of the Intel UHD Graphics 620 can be found here. The focus on office work makes in turn for an underwhelming device when gaming. 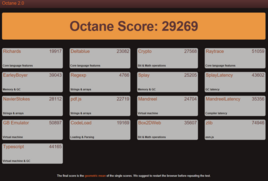 Simple browser games should however not be an issue for the Lenovo ThinkPad L480. The new Lenovo ThinkPad L480 is similarly quiet to its predecessor. 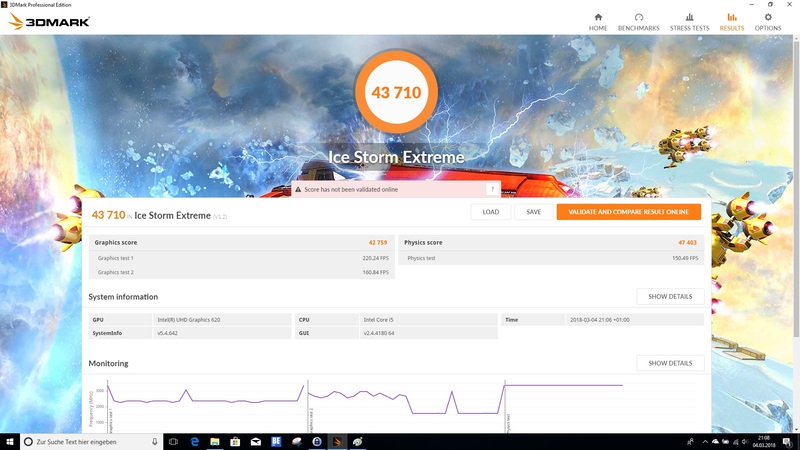 The fan is during idling completely turned off, for the most part, enabling fully silent operation. 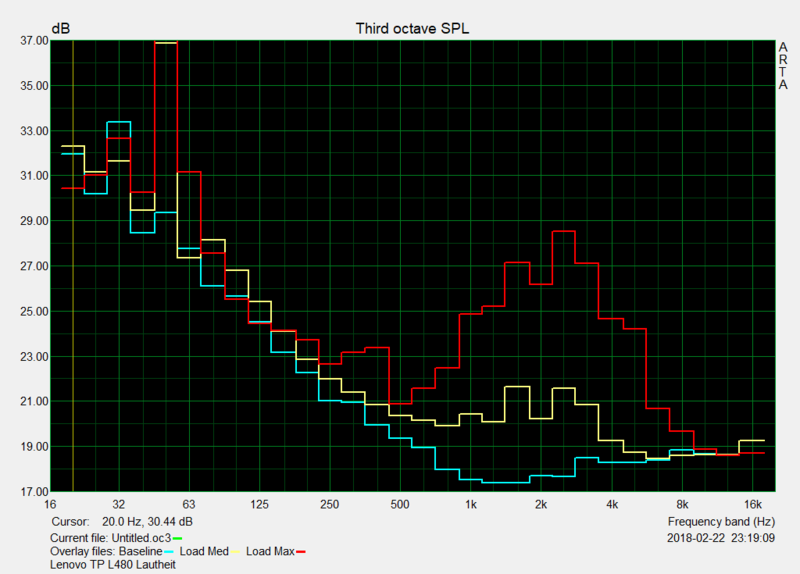 During an average workload, the L480 is quiet at only 32.3 dB(A). Under load, the fan does spin up, though at 37 dB(A) it does not become annoying. Our test sample did not display any noticeable coil whine or pulsation. 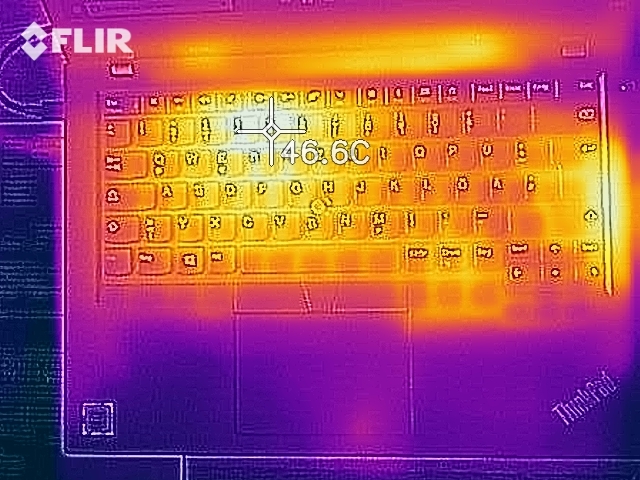 The temperatures of the Lenovo ThinkPad L480 never get problematic. 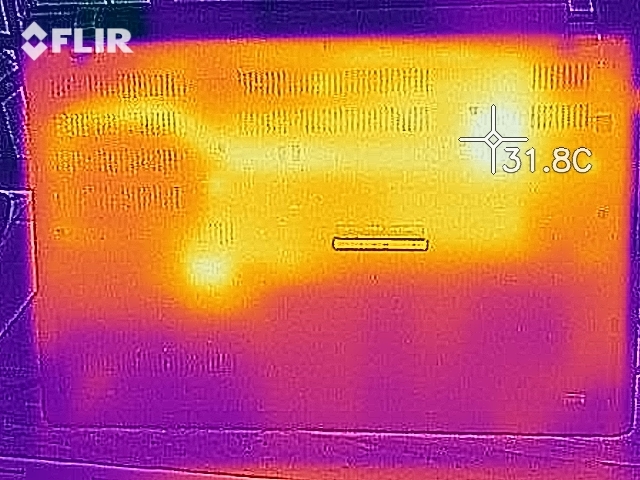 At a maximum of 43 °C (~110 °F) on the top of the base, the exterior does not get too hot. 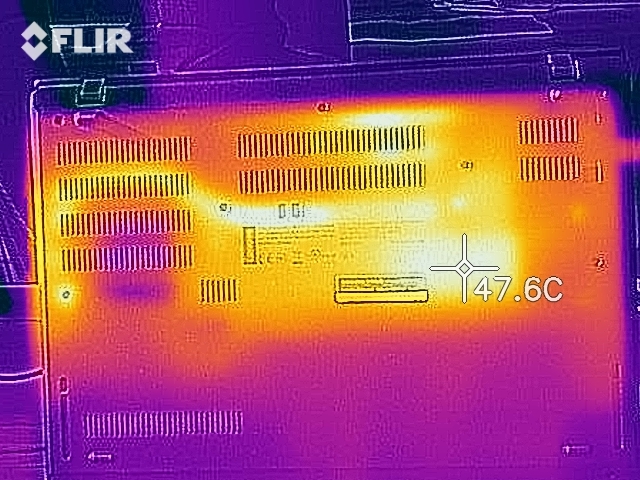 During our stress testing, the SoC reached a maximum temperature of 80 °C (176 °F), thermal throttling was not present. Equally, the constant load did not affect 3D performance negatively. 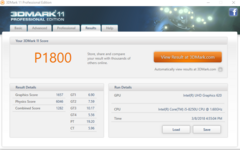 Testing it with 3DMark11 showed a near identical result to the one when got when testing the device cooled down. The two speakers at the front of the device are acceptable for office use. Voices are loud and clear without becoming distorted at maximum volume. 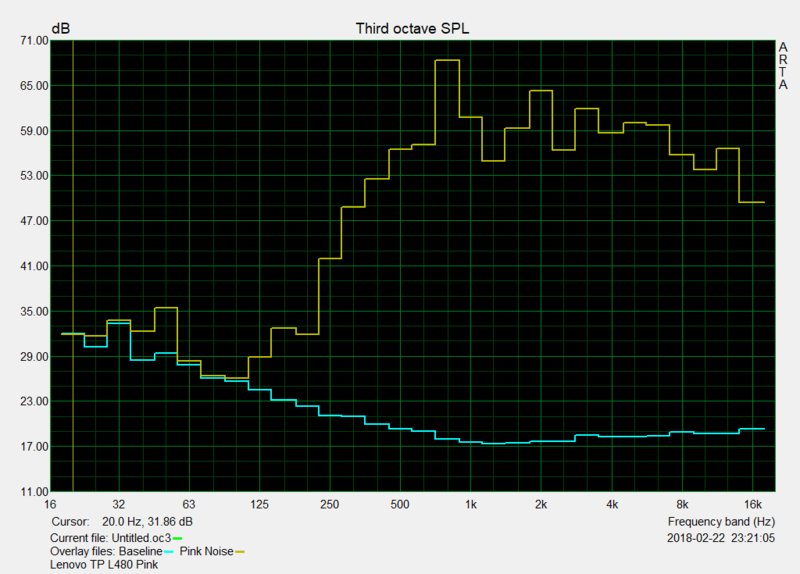 Playback can be rather heavy on highs though. External speakers may be connected via a headphone combo-jack. 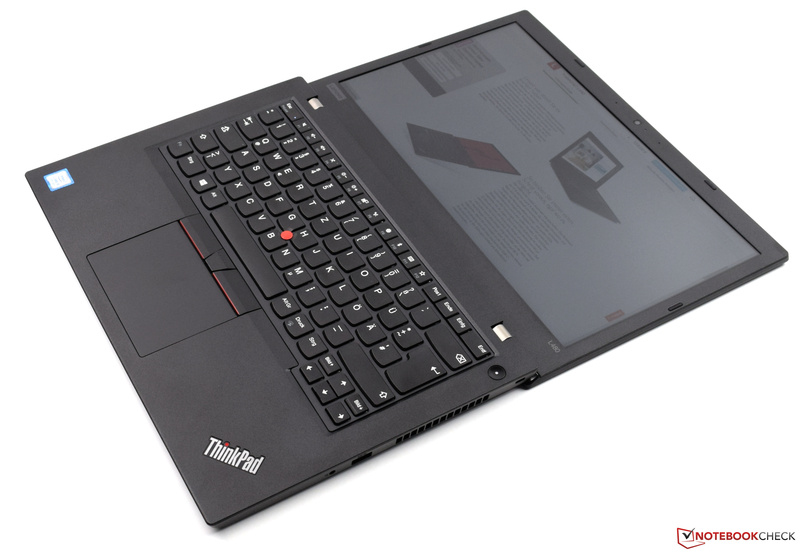 During idling, the Lenovo ThinkPad L480 only requires between 3.3 and 7.3 W, which is very efficient. 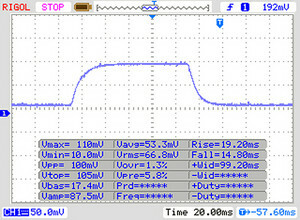 During moderate use, the small 65 W power supply needs to provide 40 W. The predecessor was slightly more frugal, however. 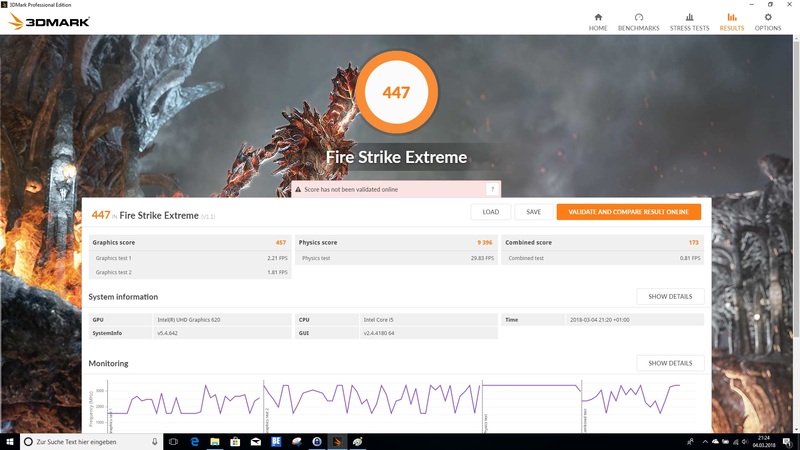 The L480 does offer more performance, however. 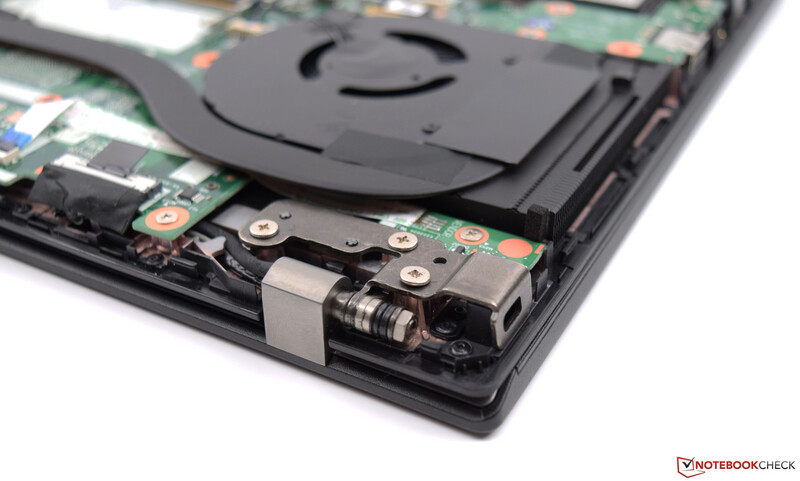 Seeing how the similarly specced ThinkPad E480 is more efficient as well, however, we believe that the manufacturer may be able to improve efficiency more via firmware updates. Compared to its competition, the 45 Wh battery is slightly smaller. 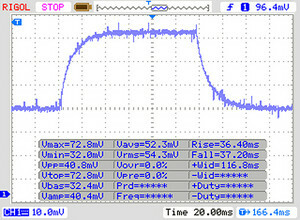 This leads to a shorter battery life, though one charge was enough to get through 7 hours and 40 minutes of our WLAN test. 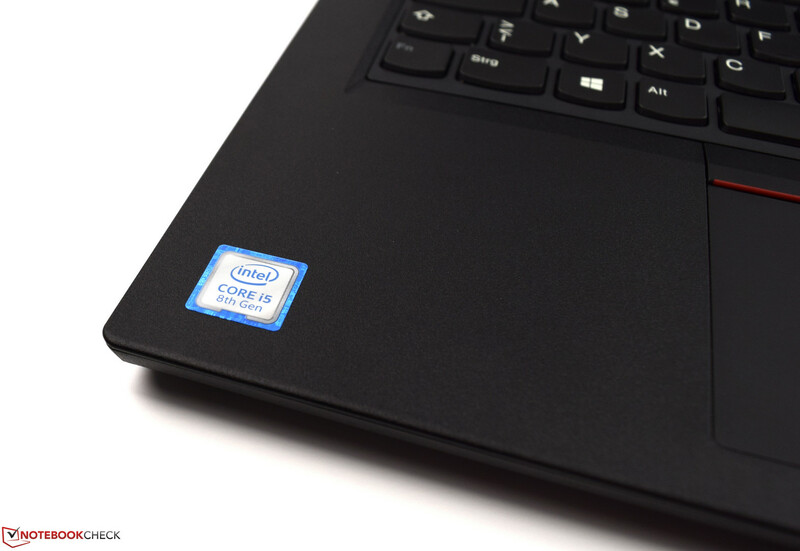 All in our comparison are far behind the Dell Latitude 5490 though. Efficient use is required to make it through an entire workday on a single charge with the L480. Recharging at only one and a half hours is short, however. Adding to that, 3D performance is not reduced when using battery power. 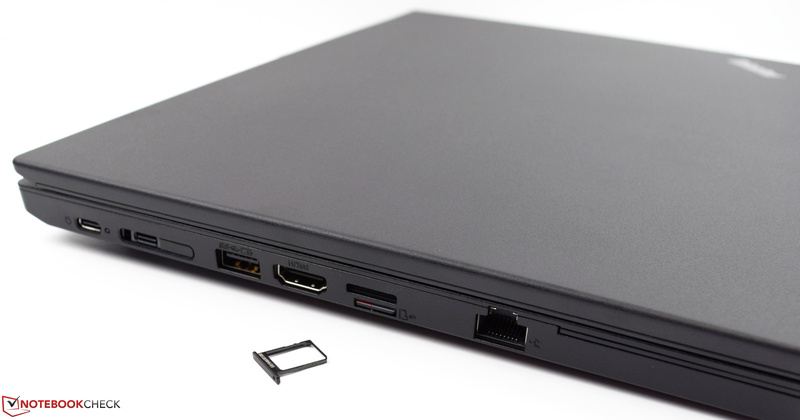 The Lenovo ThinkPad L480 is the definition of a 14-inch business laptop. 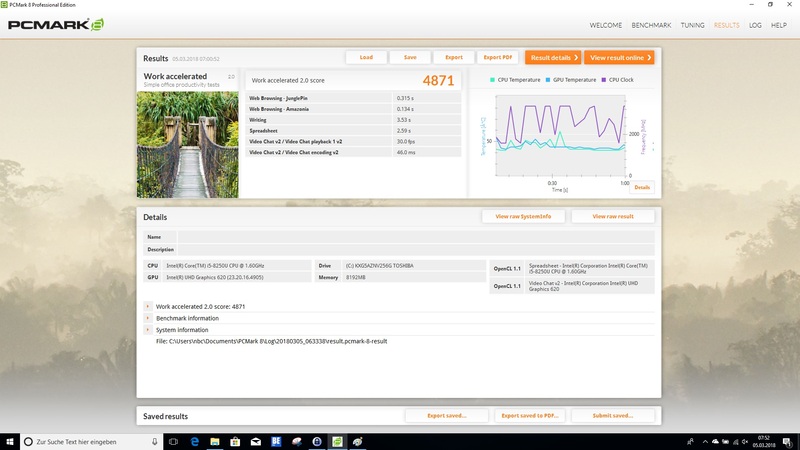 In our configuration, the device offers a quick, yet efficient processor. 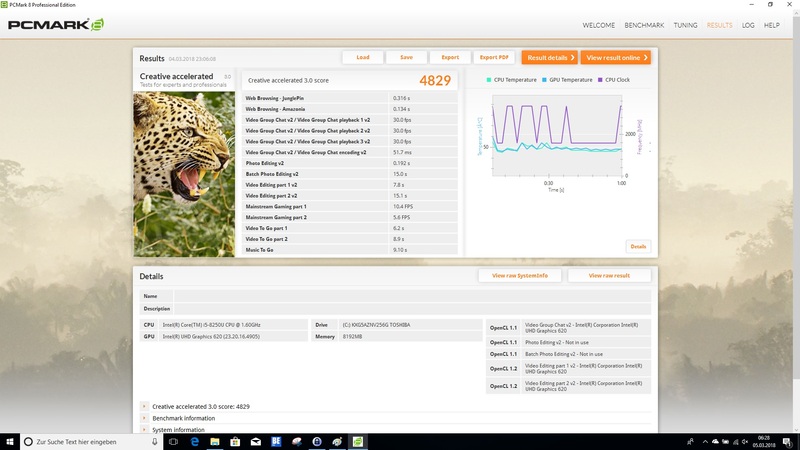 The Intel Core i5-8250U offers enough performance for most office tasks and should be future proof due to its performance. The 8 GB of memory and 256 GB SSD are also well sized. 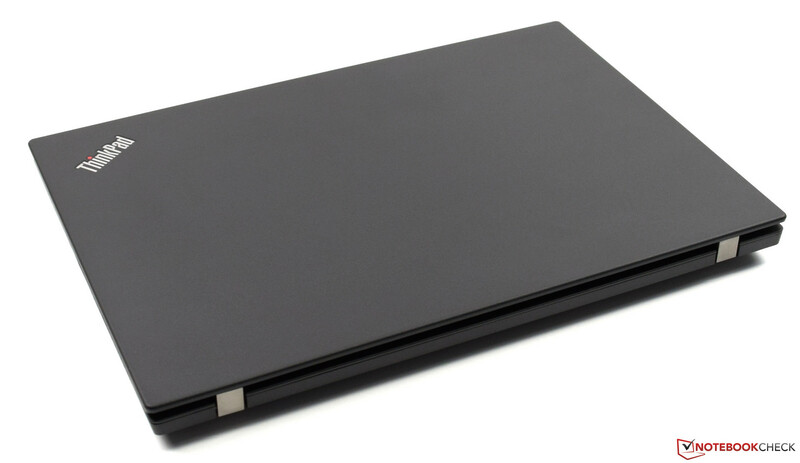 The slim, yet stable chassis and IPS panel complete this package. 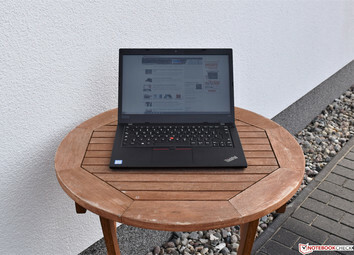 For less than a 1,000 Euros (~$1230), customers get a well-equipped office notebook with the great input device ThinkPad is known for. The plethora of configurations also allows one to perfectly calibrate the business companion. The display, however, leaves us with mixed feelings. 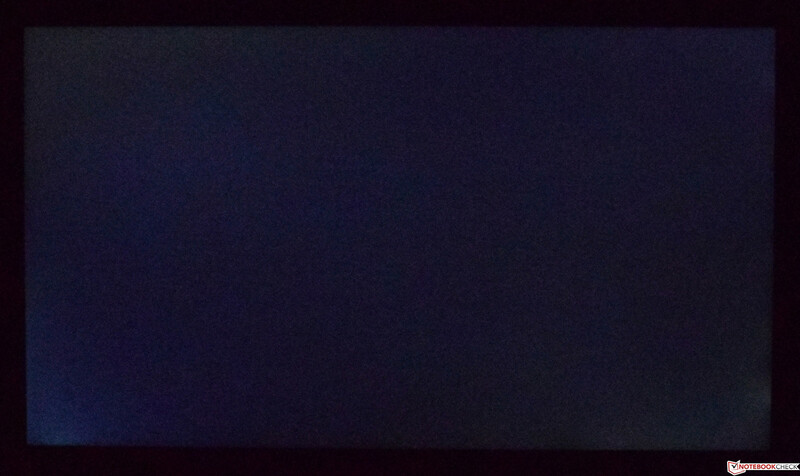 Having an IPS panel is good, the brightness it delivers, however, is not. Users will have to make compromises when working outside. Adding to that, battery life is not a strong suit compared to the competition. Performance and the high amount of usable ports are good, however. 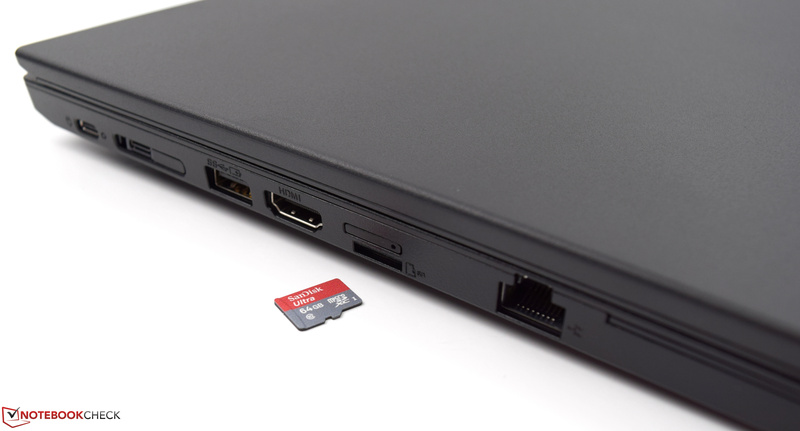 The change from an SD card reader to a microSD card slot is noteworthy too.